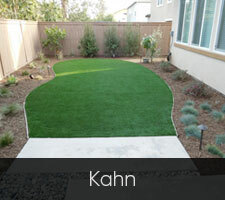 We can help you have a lush backyard haven: artificial turf – better than a perfect grass lawn! Do you have to water artificial turf? 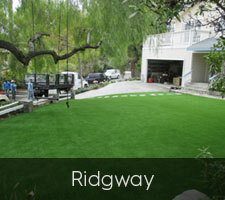 Artificial turf is a great option for a perfectly manicured lawn under drought conditions. You do not have to worry about upkeep or violating water restrictions with waterfall garden features to have a pretty lawn. Our highly trained experts offer professional artificial turf installation services that will help you style up your outdoor space instantly. Everyone deserves their own oasis-inspired area and we want to help you have yours. So, feel free to contact us and get a custom-designed synthetic turf yard today. You might be wondering why you should get artificial turf instead of natural grass. You’ll be glad to hear that our professional team can provide you with a dreamy landscape design in San Diego by installing artificial turf that brings more than a few vluable benefits. Our competent team will help you increase the value of your home by boosting your home’s curb appeal and creating a backyard sanctuary like no other. With our help, you can capture the relaxing vibe of the Sunset Cliffs right in your backyard retreat. Still in doubt? Keep reading! Simply put – no, you don’t! Our high-quality artificial turf requires little maintenance to preserve its natural-looking appeal. You don’t have to worry about wasting your valuable time watering and mowing your lawn. Instead, you should just spray it with some water mist to keep it cool during those scorching days if you’re planning to spend some time outside enjoying your green lawn. This way, you can reduce the temperature to a natural level and then sit back and unwind. Our first-rate turf does not need to be mowed and it’s easily cleaned with a quick rinse of water. Yet, our artificial turf is perforated and drains just as natural grass would. You should keep in mind that this is a valuable advantage that can help you reduce your water consumption. Water restrictions in the area aim at making our homes more sustainable and eco-friendly. If you want to further reduce your water use, you can always follow the San Diego water conservation guidelines. Another great advantage that our premier artificial turf brings is increased savings in the long run. By installing our artificial grass, you will reduce your water bill significantly since you will use almost no water for maintenance. What’s more, mowing your lawn won’t be on your household chore list because you’ll always have the look of freshly cut grass. This also means that you won’t use electricity for maintaining your lawn, which is yet another opportunity for increasing your savings on utility bills. On top of all that, a charming landscape with lush artificial turf will increase your home value, which will certainly be a plus if you ever decide to put your home on the market. If this happens, you may even be able to recoup the costs of installing artificial turf entirely. 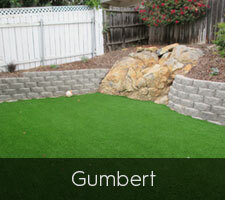 We are known for the best artificial turf installation San Diego has to offer. There’s no doubt that we’ll help you have an outdoor space you’ve always dreamt about. Our lasting artificial turf installation starts with proper prep work. In order to get the best results, our landscaping company doesn’t cut corners. We make sure all the groundwork is laid out the right way the first time. We start by using a superior class II road base, which consists of a 3-inch layer of crushed rocks that are compacted and then smoothed out. 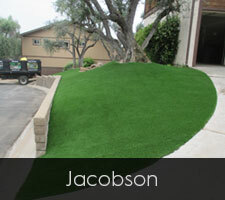 This provides a natural contour for your artificial turf. Once we have a base, we can lay down your new artificial turf. We use Tiger Turf products, the best on the market, to create a perfectly natural look. Not all installation and turf materials are created equal. Booking with us, the best artificial turf installers in San Diego, will ensure the long-lasting appeal and durability of your artificial turf. Our superb artificial turf can handle the natural wear and tear from pets and children, and it springs right back into place. It can withstand the heat, too. In areas where temperature rises above 80-90 degrees, we can use a product to decrease the blade temperature. We’re bound to show you the natural feel and look you can achieve with a turf yard. If you are thinking about installing synthetic turf, call us for an estimate today! We can create the perfect, natural lawn that requires little maintenance. How often your turf is rinsed and groomed depends on the activity level it receives. Higher traffic areas should be groomed more often. Whether for your home or place of business, we have the perfect synthetic grass for you. We offer a range of different options, so you can choose one that you need depending on the aesthetic appeal you want to create and the function you need to meet. We provide highly durable artificial turf for high-traffic areas, such as sports fields and parks. Many kennels, animal hospitals, and ranch owners also go with our top-tier synthetic turf for easy cleanup because our product is animal-friendly. 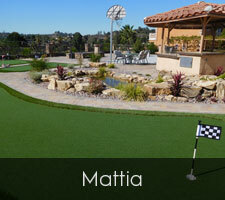 As the leading artificial turf installers in San Diego, we only deliver the products of the highest quality. By comparing face weights, stitch rates, nylon thatch percentage and backings, you will discover why the products we offer are superior. Durability and longevity should be balanced with the cost and aesthetic look of your lawn. Our company delivers all of these. The artificial turf will completely complement your vinyl or stone patio and match the aesthetics of your exterior. Whether for playgrounds, an office landscape, or a backyard garden with an outdoor BBQ island, we can find the perfect synthetic turf solution for you. Why waste time, money, water, and a lot of sweat on natural grass when we can offer you a better choice? We also offer comprehensive San Diego backyard landscaping services and provide a range of other high-quality products, including the best patio pavers, cozy fire pits and calming water fountains in San Diego. Contact our landscaping professionals today!